Southern California home prices and sales both posted solid gains in 2017, creating new obstacles for homebuyers and their agents while generating billions in additional revenue for sellers and real estate brokers, year-end figures released Wednesday, Jan. 24 show. For home buyers, it was a year of bidding wars, with many ultimately getting priced out of the market, real estate agents said. Meanwhile, agents struggled to find sellers willing to list their homes with them, and it took longer to find homes their clients could buy. The median home price — or price at the midpoint of all 2017 sales — hit $492,000 in Southern California, Irvine-based data firm CoreLogic reported. That’s up 7.4 percent from 2016. Prices were up in all six counties in the region as well. Orange County had the highest median and one of the smallest price gains: $685,000 for the January-through-December period, up 6.2 percent. San Bernardino County, conversely, had the lowest median and the biggest year-over-year percentage gain: $310,000, up 9.2 percent. Los Angeles County’s full-year median of $560,000 was up 7.7 percent, while Riverside County’s median rose 7.1 percent to $355,000. Despite high prices and the lowest number of listings in five years, 2017 sales were up 2 percent, with the most transactions in 11 years, CoreLogic figures show. Almost a quarter million Southern California homes – 249,268 – changed hands last year, CoreLogic reported. Sales also hit 11-year highs in Los Angeles and Orange counties, CoreLogic figures show. Los Angeles County had just over 82,000 transactions, while in Orange County sales topped 38,000. Riverside County sales totaled just over 43,000, a seven-year high. San Bernardino County had more than 32,000, an eight-year high. Cosner defined Orange County’s “affordable” market as homes selling for under $1 million. Buyers in that price range frequently bid on four to six properties before making a winning bid, he said. The median price of a condo – long considered affordable for entry-level buyers – was just under $500,000 in Los Angeles and Orange counties. Pricier homes accounted for most of Southern California’s sales gains. In December, for example, sales fell 14.2 percent for properties selling below $500,000 as lower-cost listings grew increasingly scarce. Sales for homes priced above $500,000 increased 9.3 percent in December, and sales of $1 million or more increased 11.6 percent. Gains were tracked even for some of the region’s priciest homes, said Coldwell Banker’s Foster. For example, Los Angeles County had 602 sales of $5 million or more, up 17 percent. The county had 52 sales for $20 million or more, up from 33 in 2016. “There’s been a significant run-up in the ultra-luxury market,” Foster said. Despite the frustrations, the industry as a whole prospered last year. Southern California real estate commissions totaled $4.5 billion through November, up 10 percent, figures from the California Regional Multiple Listing Service show. That’s assuming brokers got a 6 percent cut of the region’s $74.6 billion in total sales dollars (although actual commission percentages vary). Jamie Duran, Coldwell Banker Residential Brokerage president for Orange County, San Diego County and parts of Riverside County, said almost half of her agents did better last year than in 2016. Home sales started to drop by year’s end, although prices hit a record high, CoreLogic figures show. Southern California’s monthly median was $507,500 in December, up 8.2 percent to an all-time high. 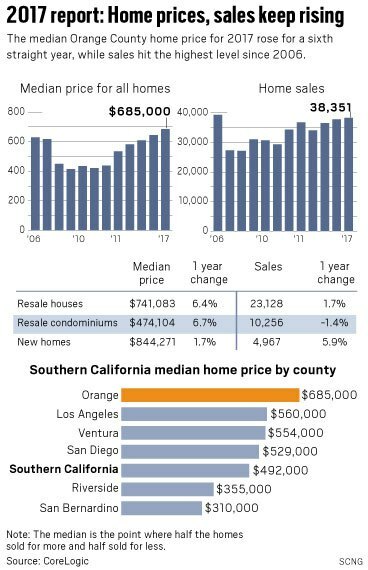 Median home prices topped pre-recession records in Los Angeles, Orange and San Diego counties, while prices in Ventura County and the Inland Empire have yet to get back to pre-recession levels. But bubble-era prices have yet to be reached on an inflation-adjusted basis. December’s median, for example, was 12.6 percent below the pre-recession peak when adjusting for inflation, CoreLogic reported. Sales meanwhile fell 3.8 percent to 19,745 transactions in December, falling in every county but San Bernardino.